Now this is what I'm talking about, an electric vehicle that really makes sense: a pickup truck. Not only is this one capable of highways speeds and several hundred miles on a charge, but it looks so darned good. The body styling is excellent. This design would sell like hot cakes as a gas model. Kudos to Phoenix MotorCars for not neglecting the look factor (which is crucial, IMHO, for the mainstream acceptance of electric vehicles). Of course, electric power is ideal for utility vehicles due to the high torque of electric motors and the fact that many utility vehicles don't actually travel very far each day. This thing sounds like it would be as fast off the line with a loaded bed as my V8 F150. All it needs to be completely awesome is a lightweight camper shell clad in solar panels. These would help top up the batteries while the truck was parked AND increase mileage due to decreased wind resistance. My first electric vehicle was a milk delivery 'pickup' (okay, it wasn't mine, but I was responsible for getting it back to the depot in one piece every day, which I managed to do most of the time). It hauled a very heavy load of milk in glass bottles and metal crates at urban speeds for eight hours a day. I know from my contractor buddies that their work pickups put on a lot of miles around town each day, but rarely more than 100. And most of those trucks spend a lot of time in traffic or parked at the job site. I think this is an excellent market for electrics. FYI, people tend to grossly under-estimate the buying habits and outlook of construction workers. In my experience they care just as much about the environment as any other group of people, and they sure as heck care about the exact number of dollars per day that it costs to run their trucks. 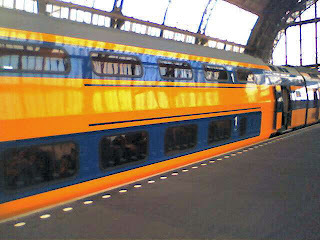 The clean and attractive train you see on the left is the one that whisks you from the basement of Amsterdam airport to the heart of the Dutch capital for $3. Yes, you read that right, $3 give or take an exchange rate fluctuation or two. The fact that you can't catch a train from Washington Dulles airport (IAD) to the heart of America's capital is a sad reflection on the lack of resolve to 'do something' about road congestion, automobile pollution, and oil addiction. Now, IMHO, the DC Metro is one of the best in the world. So there should be a Metro terminal in Dulles, or better yet, a direct high speed line right to the heart of the capital, with heavily-subsidized tickets that shout "We know how to reduce traffic and pollution and oil addiction." Ford isn't the only global car maker than is under-supplying small cars to the US (a crime of which I recently accused Ford, which is stingy with the US Focus, not to mention downright missing in action with the Fiesta and Ka). 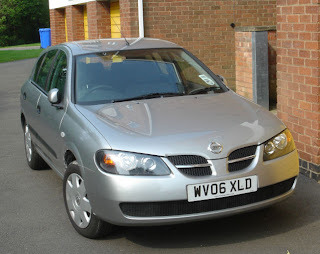 On my last trip to the United Kingdom I rented a Nissan Almera. 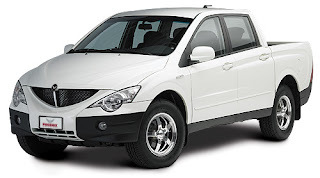 I cruised the motorways at over 80 mph in this vehicle, a comfortable 4-door (with hatchback). And I got the equivalent of 40 mpg doing so (slightly less in town, but I reckon close to 37 mpg overall). I can think of no reason that you can't buy one of these today at your local Nissan dealer here in America. BTW, remember to do the math when comparing UK and US mpg numbers. There are 160 fluid ounces in a British gallon versus 128in a US gallon. So when the Brits say a car gets 50 miles to the gallon over there, that's like 40 mpg over here. Focus? Come on Cobb, where's the Ford Focus? Some readers complained that my recent comments on low mileage cars excluded the thrifty Ford Focus. If you read carefully you will see I was highlighting cars that had recently been introduced in the US to provide more options for mpg-conscious buyers. I give credit to Ford for offering the Focus in the US for many years BUT the US automaker gets a big de-merit for limiting the Focus offerings to models with low-end trim. The big market in small cars is "small-but-perfectly-formed" of which the VW Jetta would be one of the best examples if it was reliable. Folks want all the bells and whistles in a small fuel-efficient package. 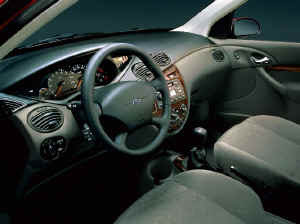 The models of Focus that you can buy in the UK for example, like the leather-trimmed Ghia, are what we need over here. Check the cool interior above. And note that the Ford Fiesta and Ford Ka, sold in the UK for over 5 years at least, are smaller and more efficient than the Focus, and not sold in the US. 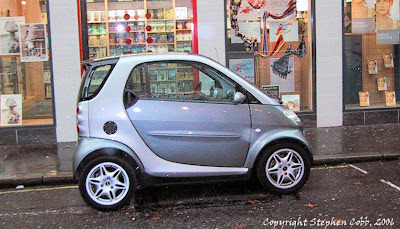 Smartcar Looks Smart:: We want smart cars now! Seen here outside Foyles, the largest book shop in London. The sad thing is, that was THREE YEARS AGO! Come on people now, let's sign together: We want fuel efficient cars NOW. Nothing will cool the tension in the Middle East like a big fat drop in U.S. fuel consumption. Wise old Sheik Yamani figured that out back in the seventies: Jack the price of crude too high too fast and Americans will switch from Caddies and Lincolns to Toyotas and Hondas, cutting demand. Sure enough, gas consumption dropped off at the end of the seventies and didn't rebound until the late eighties. Believe a former petroleum accountant when I say, there is a nightmare scenario for oil producers: Crude left in the ground. This can happen if price per barrel falls below the per barrel cost of extraction, which rises as an oil field ages. Here is an interesting snippet from Yamani back in early 2005. Note the correctness of his prognostications: oil has fallen off its highs. And Americans can now buy the 40 mpg Toyota Yaris, the 38 mpg Honda FIT, and 36 mpg Nissan Versa, all introduced in recent months to round out high mileage offerings. Add a bunch of 60 mpg SartCars to the mix and average mpg could drop enough to scare producers into being more amenable to diplomatic negotiation (not to mention the reprise from pollution). While DaimlerChrysler continues to deny Americans the Smartcar, these superb vehicles are finding many uses in other countries. 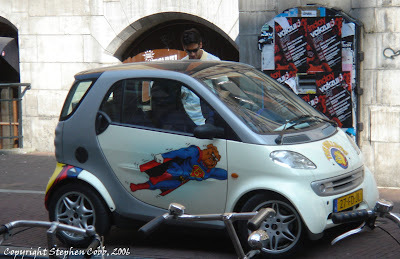 Here is one I saw in Amsterdam being used for commercial deliveries (with just a driver in the car it can carry a surprising amount of stuff). I am a big believer in getting a good night's sleep when traveling. This has been made easier by the move to upgrade bedding, led by Marriott if I am not mistaken. But even on a "plush" bed I will have trouble sleeping if the room is not dark. This is especially important when you have shifted time zones and want to acclimate to the new zone. Of course, most decent hotels provide light-blocking drapes/curtains, but for some reason I have yet to fathom, these often fail to close all the way. The result: the lights from the parking lot keep you awake; or a shaft of blinding sunlight strikes your face at 6:30AM when you really needed to sleep until 8. The answer: binder clips (medium). These are the metal spring clips you get for just pennies a piece at the office supply store. I have had great luck in keeping drapes from drifting apart with just one or two of these clips applied to the inter-folded edges of the fabric. Slip a few into your bag before you head out. Another room darkening trick is to roll up a surplus part of the bedding (one of those foo-foo decorative cover bits for which I don't even have a vocabulary) and put it across the bottom of the hotel room door, you know, across that yawning gap which doesn't seem too bad when you first turn out the lights, but slowly expands to admit enough light to read by. Here's an old travel tip made newly useful by the increase in lost airline luggage, due to the increase in checked luggage, due to the reduced-liquid-in-carry-on rule: travel light. Easier said than done maybe, but think about the last time you flew. Did you wear all of the clothes you took with you? A lot of people will admit that they did not. Next time, take two items out just before you leave. I bet you won't miss them. Repeat each trip until you are down to the bare essentials. And what about the essentials? Could you have packed fewer items if you had a chance to wash your clothes during the trip? Well you do. 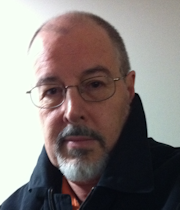 Here's what I do when traveling on business in North America, i.e. staying in hotels at night and wearing a shirt and tie during the day. I take just two shirts and wash one every night in the sink in the hotel bathroom. Tepid water and a touch of hotel hand soap. Then I wring them out in a hotel towel (I will post some pictures if this is hard to visualize). Then I hang the towel and the shirt to dry, smoothing out the main wrinkles in the shirt and putting it on a hotel coat hanger in the bathroom (for hotel hanger's that don't have proper hooks just hang the shirt on the rack or use a twist tie--I carry several with me, plus a few rubber bands and binder clips--more on those later). The typical American hotel is so dry that the shirt is bound to be ready by morning, plus the shirt and towel will have eased, slightly, the humidity in the room, which is good for you. Use the hotel iron to remove any remaining wrinkles (I've noticed a lot of budget hotel chains are now providing irons). To make life easier, chose a good no-wrinkle shirt to start with. I find JCPenney Stafford shirts work great and look great after dozens of washings, but still have the feel of 100% cotton. Wash-as-you-go helps reduce the amount of stuff you carry on with you, and the impact of misplaced bags. Since I travel in a good shirt, lost luggage won't stop me looking good the next day. I became a believer in this strategy about 20 years ago when I took a day trip down from the home office in San Francisco to a client site in LA for 8 hours of consulting that stretched into two days. The client was delighted that I could stay the extra day and didn't even notice that I had not brought a change of clothes with me. I just washed the essentials overnight. The nose of the DaimlerChrysler Smartcar, photographed in London. There are over 750,000 on the streets of the world, but they are still not sold in America. How backward is that? Aeroflot Tupolev Ty-154M passenger plane, taking off from Moscow airport. 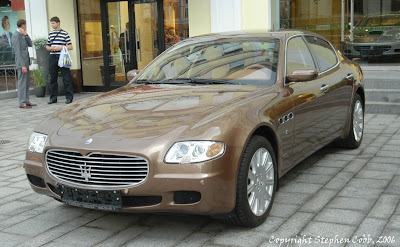 Maserati Quattroporte, the most elegant four door passenger car design ever (IMHO), photographed outside a showroom in Moscow, then turned into a pencil sketch with PaintShop Pro. See the real thing below. TGV high speed train, photographed in the Gard du Nord, Paris, after I arrived there from Amsterdam on the Thalys, another high speed train. The lack of high speed trains in America is testament to the continuing power of oil companies and the trucking/road building lobby (favored by a certain governor turned president). A train, a plane, and two automobiles. A taste of things to come. Oh, and the blogspot template that formed the basis of this page? It is called Lighthouse, but it looks a lot different from this when you first install it. Looks like I'm going to be doing some more traveling and so I figured I would start a blog to share some of my experiences and maybe help people get more out of their travel. Will also post some photos from along the way. p.s. When someone says "On the road again" do you think of Canned Heat or Willie Nelson?